Bolt a Corvair Engine Into Your VW And Make It A Real Bomb! Well, maybe "bolt" isn't quite the right word, since that listing (from the 1975 JC Whitney catalog) mentions that "some modification to engine compartment" is necessary to fit the GM pancake six into the People's Car. 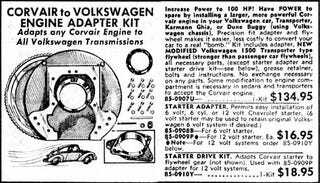 Since getting a VW Type IV into a Beetle is quite the Sawzall job, one can only imagine the rending of metal necessary to shoehorn the much larger Corvair mill in there. But still, the idea of a time when the junkyards were full of Corvair engines and air-cooled V-Dubs clattered down every road seems appealing.